When we hear the word ‘parks,’ we think of people picnicking on manicured lawns… We envision those overseeing City parks out there riding around on golf carts checking on malfunctioning water fountains (except when they are mowing down and killing seagulls and pigeons but that’s another story – unfortunately a true one). 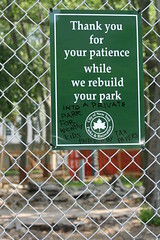 In NYC, a much more deviant version exists within our Parks Department. Under Mayor Bloomberg, Parks are looked at as playgrounds for the corporate elite, vehicles for privatization, and places to further an agenda for a sanitized version of New York in which the gritty, the bohemian, the diverse is airbrushed away. *Randall’s Island Privatization Proposed – Instead of making this a unique public space for the benefit of all, Benepe and Bloomberg were hoping to privatize this 273 acre park and give the majority of its access to 20 private schools within New York City. *Yankee Stadium Deal leads to Destruction of two Parks in the Bronx — In the Bronx (which desperately needs parks) destruction of parts of McCombs Parks and John Mullaly Park as well as death to 300-400 trees in a deal to build Yankee Stadium. *Ripping Up Bronx’s Van Cortlandt Park for Water Filtration Plant – The City had been attempting for ten years to put in a water filtration plant in this spot. Despite having an alternative, more favorable location to turn to, Mayor Bloomberg was able to buy favor with State legislature and rip up nine acres of Van Cortlandt Park disrupting the park usage for this under-served neighborhood, giving nothing back in return. *Brooklyn Bridge Park Private housing – Bloomberg argues that this park needs to be “self-sustaining” (i.e., make money) and plans are moving forward for private real estate interests and hotels to be built within this Park. *Washington Square Park — Plans include: Reduction of 23 % of the public space, manicured lawns and “plazas” which destroy the historic nature of this Park as a political and social gathering spot, “aligning” the famous fountain with the Arch (despite the fact that noted original architect Stanford White purposefully placed the two unaligned over a century ago), corporate naming rights of the fountain being given to the Tisch Family, cutting down of 11 trees thus far, and more! We have to wonder where is the oversight? Where is our City Council? The Parks Department being a City agency that reports to the Mayor, the City Council takes mostly a ‘hands off’ approach. I’ll venture into the ineffectiveness and apparent duplicity of City Council Member Alan Gerson in relation to what is happening at Washington Square Park in another post. However, as the City Council Member who represents the Washington Square area and is also a member of the Parks & Recreation Committee, he could initiate hearings on the Parks Department and the issues above. One way or another he always gets what he wants. The congestion pricing is a perfect example. Blocked one way, he created another diversion by holding MTA maintenance and the 2nd Avenue Subway to get what he wanted. He’s a player, but a good one. That said, and as much as I mourn the loss of so much what New York City was, he’s managed to save this town financially. The parks Dept is the most racist dept to work for, Adrian Benepe was brought in after Henry Stern because of lawsuit against the city but Benepe continues the same policy as Stern, promotes whites over black and spanish. I hope if Bloomberg got relected he got rid of that racist animal. I don’t believe that anyone or any group ever compares the contracts to build or rebuild parks to the work actually done. Right now I am looking into contract (MG-40950-107M) which lists 72 items that were contracted out to Medco Electric, Inc. for Phase I of Haswell Green park on the East River at 63rd Street for a total of $1,146,920.00. Item number 9 is “Triangle Building Work”. From the description of “Triangle Building Work” from contract pages 254A and 254B, it appears that the park was supposed to contain a huge corner flower box complete with drainage and a ground hydrant. Item 9 Triangle Building work was contracted out for $30,000 for labor alone –not including materials. This work was never done. The Triangle building remains as it ever was. Interesting. I suppose it would be interesting to know … did they get paid for that portion of the work? Is there a way to compare the contract to the resulting payments? From what I hear, the Parks Dept does not always pay for things that actually get done, as it is, or takes a very long time doing so. That would be my only comment about this although, believe me, I agree there is likely something sketchy going down with regards to the Parks Dept. and money allotted to work on our city parks.